Alicia Cheung loved Niles Lichtenstein, but she wasn’t crazy about his black leather sectional sofa. That’s not to say it was a deal breaker, but to her, one of the founders of sfHEIMAT, one of the city’s best new interior design firms, aesthetics matter. Niles Lichtenstein and Alicia Cheung Lichtenstein at home. When the couple got together, they opened a joint account to use for redecorating the apartment. The sofa is from Crate & Barrel, the rattan chairs are from Blue Ocean Traders, the coffee table is vintage and from Donny O Antiques. The Moon mirrors are by artist Heather Palmer and the 1C pendant from Flos by Michael Anastassiades. That’s not to say she was completely overjoyed. After all, the main piece of furniture in the living room was a large, black-leather sofa. But as things progressed, it was clear that the two were going to be together for the long term and that the sofa’s days were numbered. As the two grew closer, Niles pulled a move that is sure to make the hearts of the design-minded a little faster. A vertical bookshelf stands in front of a vintage map. The effort brought the two even closer together. “It was our first common goal,” says Niles. “We both worked hard to make it happen, and it took our relationship to a different level.” At this writing, the couple has been married three years. Alicia designed this headboard with ribbon and nailhead trim. 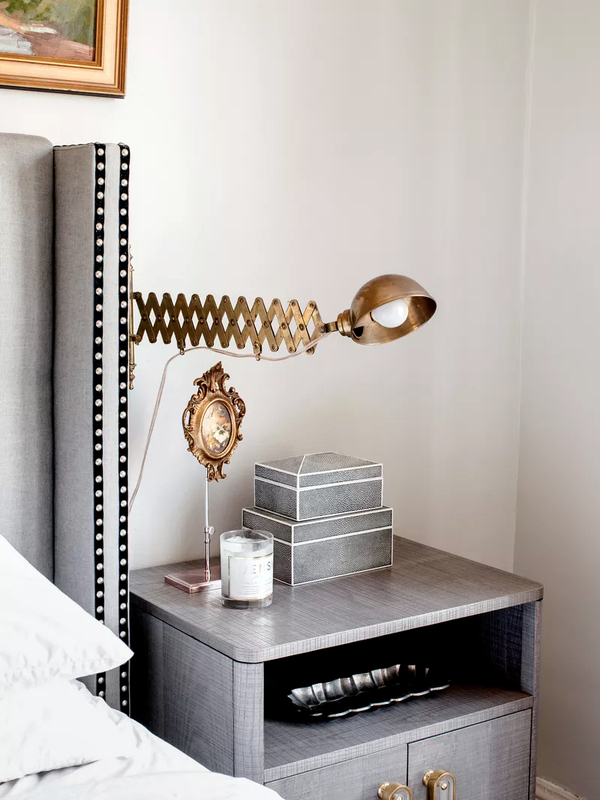 The bedside light fixture is from Hesperus Nautical, the nightstand is from Anthropologie. 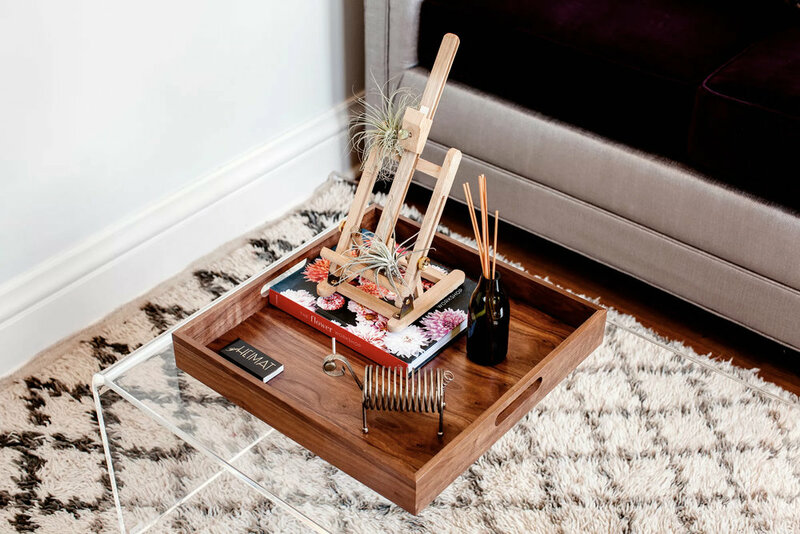 An acrylic coffee table from CB2 holds a tray that frames a small design vignette. The Moroccan rug is vintage. 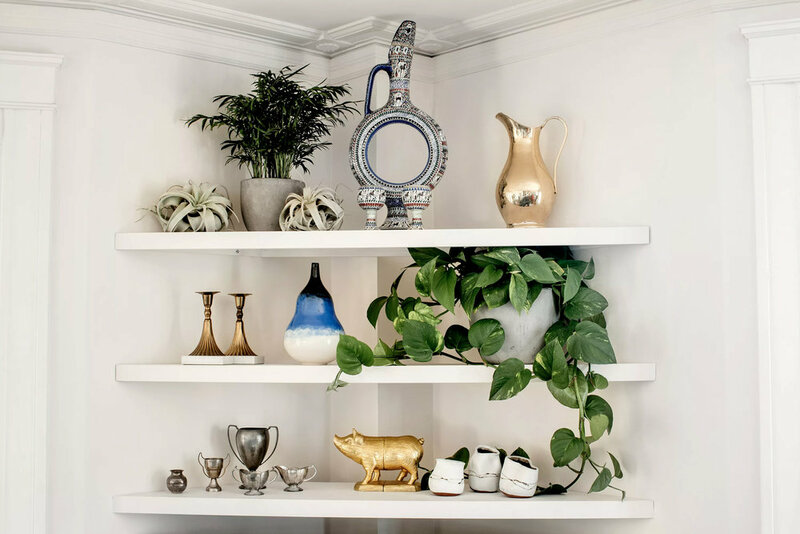 Alicia designed and installed a set of corner shelves that serve as a display area. In the adjacent dining room, she converted an antique safe with a dark-green exterior and a polished wood interior into a liquor cabinet. Beside it sits a leather suitcase that belonged to Niles’s father. A collection of candle snuffers became a graphic display when grouped together. For Niles, the founder of the start-up Enwoven, she painted the walls in a dry-erase paint, and when creative and entrepreneurial friends come to visit, the walls are often covered with ideas by the end of the evening. The Mitchell Gold Bob Williams sofa from Ruby Living unfolds to make a guest bed. 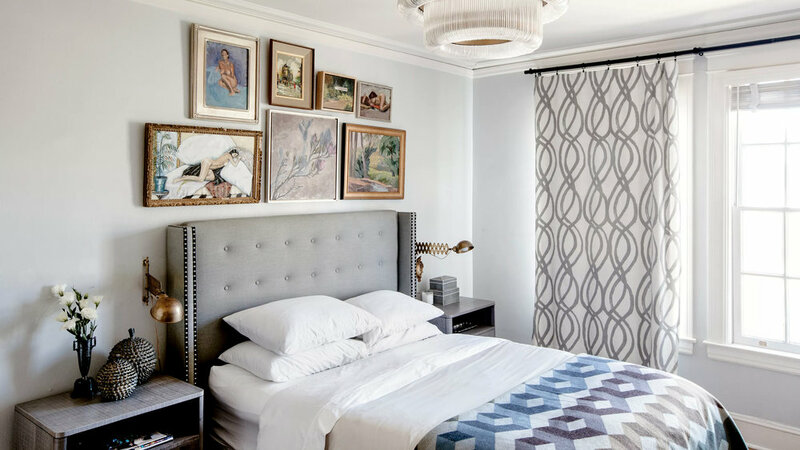 The wallpaper is by Tempaper, the art is by Randal Ford, the bedside lamp is byKen Fulk.